Hello everyone, welcome to Can I Make This? and in this episode I show you how to make gradient text in Silhouette Studio. I’m sorry there’s been almost two weeks since my last Silhouette video; I have been practicing behind the scenes, brushing up my skills but that’s of no use to you if I don’t show you what I’ve learned. Let’s get on with this lesson. As usual I found my inspiration on Pinterest, with this lovely gradient in the word happy. Gradient text in itself is simple; type text, open the Fill panel and fill with a gradient of your choice. The difference here is choosing the custom colours, and graduating the gradient across the letters so that each letter begins with the previous letter’s colour. 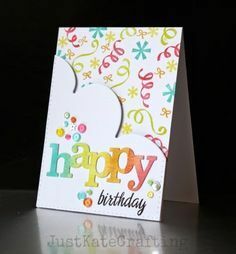 I also liked the cloud effect edge on this card, so I also show you how to do that. I don’t talk you through making the card from beginning to end; I concentrate on the cloud edge and the happy gradient text. That may, or may not, be due to struggling with my background image and deciding to leave that part to your imagination! My colour-matching isn’t perfect between the letters, that yellow between the a and p is off, but it’s close enough. I think it’s a lovely effect, and you can choose any colours at all to make your custom gradient text. Graphics: butterflies background from Storyblocks. Fonts: Century Schoolbook (happy) and Brush Script (birthday).